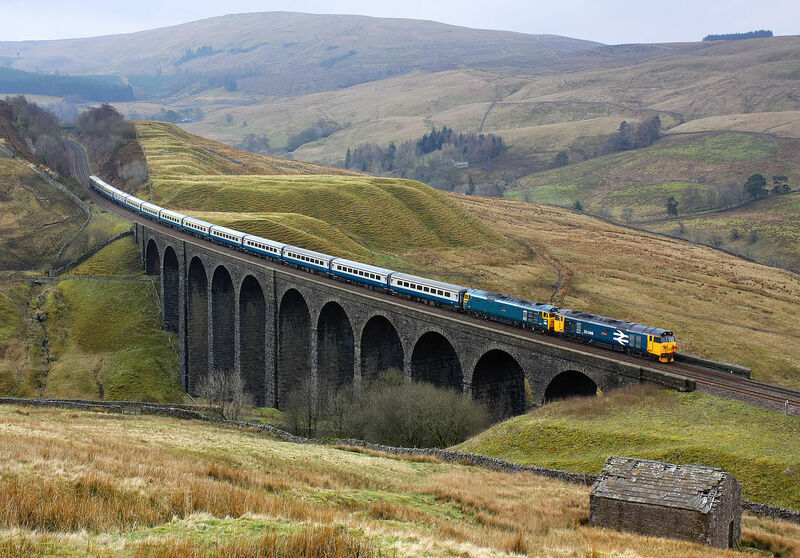 The Cotswold Line Promotion Group is delighted to announce that its 2019 charter train will take passengers from the Cotswolds to the famous Settle & Carlisle Line through the Yorkshire Dales and the Eden Valley in Cumbria. The Cotswold-Eden Express will run from Oxford to Appleby on the Settle & Carlisle Line on the August Bank Holiday Monday, August 26. Plans to run the train last year, to celebrate the 40th anniversary of the formation of the CLPG, were unsuccessful but we have now teamed up with Pathfinder Railtours for this year’s trip. CLPG members are entitled to claim a 10 per cent discount on the prices advertised at Pathfinder’s website, where tickets can be booked online. There are also discounts for bookings for a group of four people. The train will be hauled both ways between Oxford and Worcester by a GBRf Class 66 diesel locomotive, with the rest of the journey to Appleby and then back to Worcester powered by a pair of vintage Class 50 locomotives (subject to availability). The Class 50s were used on the Settle & Carlisle Line and West Coast Main Line from 1967 to 1976 before moving south to work on Western Region routes, including the Cotswold Line, in the late 1970s and 1980s. It will then run to Settle for a 30-minute stop, to allow time for the unveiling of a memorial plaque for the CLPG’s founding chairman Oliver Lovell, who helped the Friends of the Settle & Carlisle Line to fight British Rail’s plan to close the route in the 1980s. The train will then continue to Appleby, where there will be a two-hour break during the afternoon, before heading for home via Carlisle (the train will not be calling here) and down the West Coast Main Line. There will be four classes of accommodation available on board the train: standard, first class, first class plus and premier dining. For full details, ticket prices and to book, click here to go to the Pathfinder Railtours website or call their telephone booking line on 01453 834477. CLPG members will also be able to book seats using a form that will be included in the next edition of our Cotswold & Malvern Line News magazine, which will be sent out shortly. If you want to be seated with other passengers you know, who are booking separately, you can do this by giving their details using the Booking Notes/Preferences notes box on Pathfinder Railtours’ online booking form or over the phone. NB: If you are not a CLPG member, please do not try to claim the 10 per cent members’ discount – all bookings made at these rates will be cross-checked against current CLPG membership records. If you know your CLPG membership number (printed on the address label of your magazine), please give it in the Booking Notes/Preferences box when booking online or over the phone to help us and Pathfinder’s staff. *Please note that all timings are approximate and subject to final confirmation by Network Rail.